Emmanuel Centre is situated in the heart of Westminster, Central London's prime location for business, culture and government. 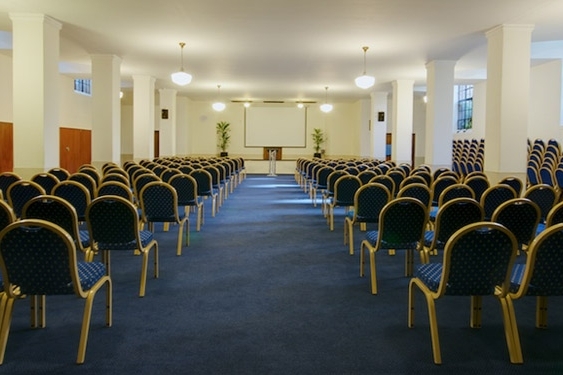 Host your event here with its unique atmosphere, its flexibility and its surprising affordability for a venue in the heart of London. The Main Auditorium, which seats up to 1,000 is completely circular and supported by 24 pairs of marble columns, with natural light flooding that through a huge glass dome and arched windows, finished off with original polished English oak panels along the walls. At the front of the Auditorium there is a small room where speakers and performers can prepare. The Auditorium comes with a fully integrated high-spec in-house audio visual equipment. Twin oak doors at the top of short granite steps in the foyer lead into this spacious upper hall. The high arched ceiling and Tuscan arches provide you with a sense of space and grandeur. At the far end is a raised stage, suitable for speeches and performances or screen projections. It is an ideal venue for gatherings of up to 300 people. If you are planning a book launch, meeting, professional examinations or seminars, this hall is for you. Descending steps from the foyer brings you into The Lower Hall, which provides a comfortable setting for gatherings of up to 300 people. Windows along the sides allow natural light into the room. The Lower Hall is suitable for meetings, exams, seminars and workshops, or for children's programmes. Emmanuel Centre is regularly used for examinations, AGM's or shareholders meetings, training seminars, product launches, church gatherings, exhibitions, rallies, presentations, concerts and conferences. Our rooms can be configured in a number of ways to meet your specific requirements. We love finding about the uniqueness of your event and how we are able to help be part of your planning process. If you have any questions regarding our event venue space, please call us on 020 7222 9191 or fill in our contact form. Created on-site by our in-house caterer we are proud to provide you with a series of delicious menus. From hearty meals, to working lunches and sophisticated canapés we have a variety of options. Whatever your requirement, we are happy to listen and create a menu that works for you, your people and your budget. We also have snack bar which is a great place for for meeting people and serving light refreshments. If you have any questions regarding our catering offering, please call us on 020 7222 9191 or fill in our contact form. Our audio visual team will work closely with you to create the perfect staging, lighting and sound for your event. With a selection of 4K, UHD and HD screen options throughout our centre, we are able to huge flexibility and the latest AV technology. Whether your event is large conference, a dancing Christmas party, or an intimate business meeting, we have developed solutions to suit your needs and transform any space to fit your event's theme and requirements.